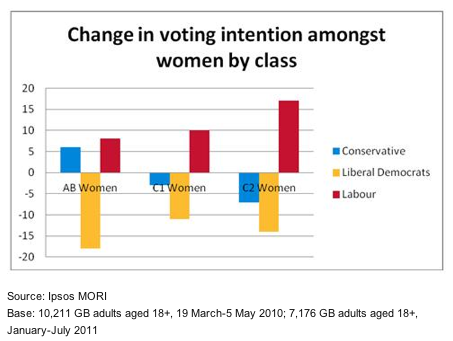 Tory-LibDem Government success in mislaying women voters! As described (https://think-left.org/2011/09/12/trade-unions-lead-the-fight-back/ ) women voters are, or will be, disproportionately worse affected by the cuts than male voters. This seems to have translated into a major fall in overall levels of ‘approval’ for the Coalition amongst women voters (only 25 per cent women voters approve, as compared with 33 per cent of men). An Ipsos Mori poll commissioned by the think tank, Resolution, broke the poll results down according to age and class (with all the usual caveats about the inadequacies of such generalizations about 52% of the population). At the 2010 general election, women were on average more likely than men to vote for both the Liberal Democrats (26%: 22%), and Labour (31%: 28%). 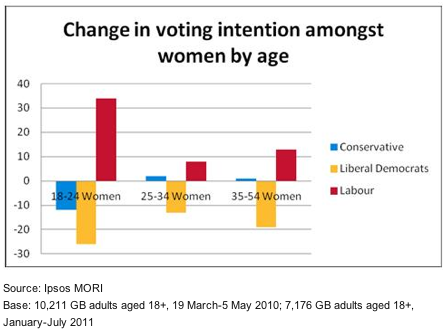 Women, aged 25-34, were also more likely to vote Labour than Conservative (by some 11% lead) but there was a highly significant shift away from Labour, for all age groups of C2 females; there being a 17% Tory lead. However, by the middle of 2011, it was found that, amongst AB females aged 18-24, support for the Liberal Democrats had fallen from 34% to 8%; and support for the Tories had dropped from 30% to 18%. Furthermore, only 13% of women felt that the Conservative Party was ‘the party which is closest to women and best understands and reflects their views’; and only 7% felt similarly about the Liberal Democrats. Women were also found to rate both Cameron and Clegg personally, 6% less favourably than did men. More recently the focus has switched to the way in which the deteriorating economic situation is impacting on many women, particularly those on low-to-middle incomes. Over the last quarter unemployment increased by 38,000, with 21,000 being women. Female unemployment had already risen by 76,900 over the last year – with the number of women out of work now 1.05 million, the highest since the spring of 1988 – and the forecasts are that female unemployment will continue to rise as women are disproportionately suffering due to their higher concentration in the public sector. Qualitative research suggests that women are more inclined to be pessimistic about the economy and feel they are more likely to lose out as a result of cuts. On top of this, particular groups of women — such as those in their 50s — are being faced with major shifts in their pension age that they weren’t anticipating, causing real concern. This entry was posted in Employment, Gender, Opinion and tagged Opinion polls, unemployment, women by syzygysue. Bookmark the permalink.